Quality Service and Quality Products are not hard to find at Denton Roof Repair. Roof Repair and Roofing Installation is made easy with our No Hassle Process and No Obligation Free Estimates! Our Professional Staff and Expert Contractors know Proper Customer Service and the Quality Products to use. Denton Roof Repair can proudly say that we have a 100% Customer Service rating with no negative reviews! Our Team can help you with any Roofing Services you need. "Ain't Nothin' Free these﻿ days..." But Our Roofing Quotes Are! Why Choose Denton's Best Roofing Company? TRUSTED IN THE COMMUNITY - Denton Roof Repair faithfully serves Denton and the surrounding areas. Our customers know what to expect when they call us; Quality and Professionalism. 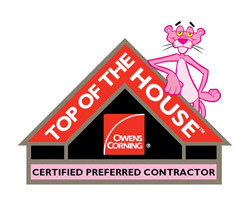 CERTIFIED AND BONDED - We are a Professional Roofing Company, and employ Roofing Contractors that are Certified in Manufactures Products as well. STRONG WORK AND BUSINESS ETHICS - At Denton Roof Repair, we believe our Ethics and Values should be seen in how we conduct our business and how hard we work. DECADES OF LOCAL EXPERIENCE - When it comes to roofing homes in the Denton area, we know what to look for. Our climate and weather helps determine what we recommend for your roof. 100% CUSTOMER SATISFACTION - We make it a point to not only meet our customers expectations, but to exceed them. We believe that's just good business. INSURANCE FRIENDLY - Denton Roof Repair has years of experience in Insurance Claims. Don't stress if you can't get through with your insurance company, we can help. ALWAYS FREE ESTIMATES WITH NO OBLIGATION - Yes, Always FREE Quotes on your Denton Roofing job, and there is No Obligation after you have a Quote from us. "Thank you Denton Roof Repair for arriving on such short notice to [our business]. We appreciate your willingness to work with us and our Insurance..."
"A big THANKS to Greg and the others that finished our roof this past week. It looks beautiful, and wanted to let you know that I will recommend you to everyone! Thanks again!" © 2017 Denton Roof Repair. All Rights Reserved. Pro Roofers in Denton, Argyle, Krum, Sanger and everywhere in between.